A B.C. 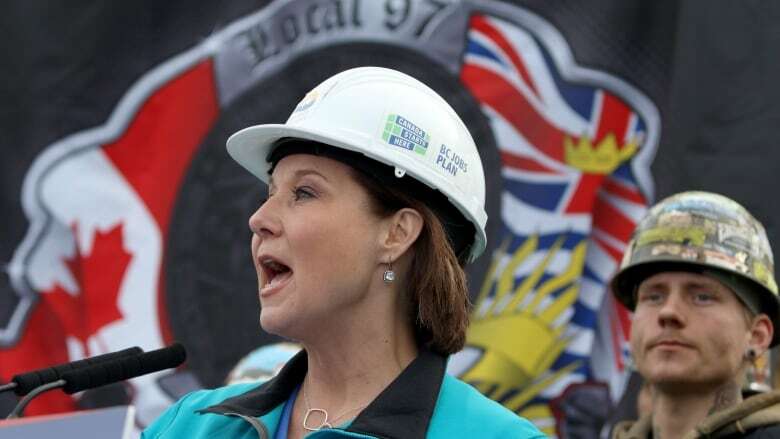 construction union has thrown its support behind Premier Christy Clark ahead of the coming B.C. election campaign, saying her government's job plan is better than the NDP's. Ironworkers' International business manager Doug Parton says the NDP's opposition to major projects that include the Site C dam, George Massey bridge and proposed LNG projects hurt the job prospects for the union's 1,800 members in B.C. "My members for years have been a labour party. What has happened in the past has made my members very concerned," said Parton Wednesday. "We may not agree with Premier Christy Clark on every issue, or the B.C. Liberals, but we believe their plan for economic growth, for apprenticeship training and all the lunch bucket, kitchen table issues that affect our members are the right ones for us," said Parton of the union's Local 97. Clark was at the Ironworkers' announcement at a Victoria condominium construction site on Wednesday, wearing a hard hat and surrounded by about two dozen workers. "I support working people," said Clark. "But the only way we can support working people is by supporting work in B.C. That means supporting LNG. It means supporting Site C."
Parton said the union never officially endorsed the Liberals in the past and the support does not mean individual members will vote for the party. NDP Leader John Horgan says the endorsement doesn't faze him much, adding major unions and organizations including the building trades council still support the NDP. "The Local 97 didn't endorse the NDP the last time around and campaigns matter and we are a long way from the campaign." Horgan said he supports LNG developments with conditions, and there's not enough evidence that Site C or Massey replacement project should be built. When questioned, he wouldn't elaborate more on the NDP's position on the Massey Tunnel replacement, adding only that the issue will be a focus in Question Period on Thursday. Mark Leier, a history professor at Simon Fraser University who studies the labour movement in B.C., said the endorsement is not a particularly significant loss for the NDP. "The fact that the Ironworkers have 1,800 members means it's not a large union," he explained. "It`s not one of the large unions that the NDP would look to for massive funding." Leier said that it was a mistake to think the B.C. labour movement was a "monolith" that would fall in line to support the NDP, and pointed out it has been a particularly rough time for private sector unions. "They have been losing members. They've been losing contracts to non-union firms," he said. "But the big question the labour movement needs to ask is not whether they'll get some short-term jobs from one government or the other, but which party is more likely to pass legislation that makes it easier for them to organize, or legislation that would ensure public projects are unionized." Keeping that in mind, Leier said the NDP has traditionally received more labour support compared to the B.C. Liberals. "[Though] both sides are courting everyone that they can," he said. "It's not going to be a game changer." The B.C. election is scheduled for May 9.